In this brief, Public Impact Co-Presidents Emily Ayscue Hassel and Bryan C. Hassel share their most recent vision of an Opportunity Culture. 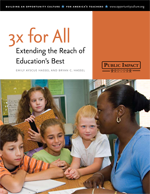 The brief explains how extending the reach of great teachers can start a virtuous cycle of excellence and higher pay for all teachers. The supply of seats in the nation’s best charter schools is not growing rapidly enough to serve the millions of low-income children who need better schools. 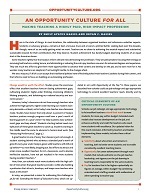 Based on lessons from the fastest growing organizations in other sectors, this report for the Progressive Policy Institute provides breakthrough solutions for growing the best charter schools and charter management organizations. With specific advice for charter sector leaders, policymakers and philanthropists, Going Exponential offers strategies that could enable every child living in poverty to have access to schools as good as today’s top ten percent charter schools by 2025. Recommendations address the major barriers limiting growth of the sector’s best, such as scarcity of excellent school leaders, funding for growth, and motivation of charter leaders to grow while maintaining excellence.